The ElectroGun HUD icon in GTA 2. Claude Speed using the ElectroGun. 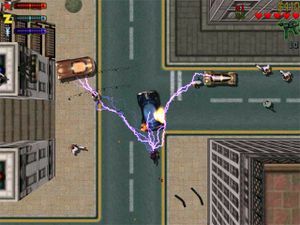 The ElectroGun is a fictional weapon in Grand Theft Auto 2. It is mainly based of a tazer gun but there is a few differences. The main difference is that this fires thunder and electricity out of the gun when fired. It is useful against a small mob as the gun fires everywhere forward and causes great damage. This page was last modified on 19 April 2012, at 20:06.